This rack is fastened to the roof via an aluminum "T" extrusion that's been hand formed to conform to the roof curve. The roof has 36 threaded inserts (10-24) installed from the outside in. Much effort was made to prevent leaks through the attachment: All inserts were carefully sealed with silicone when they were installed. When the extrusions were put on, the screws were sealed too. 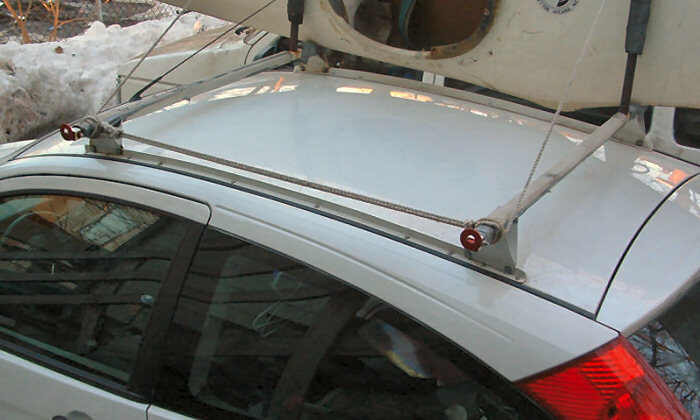 A 1/8" foam strip (with holes) was put between the aluminum and the roof. So far (6 years and 60K miles), the system has worked perfectly. No leaks. 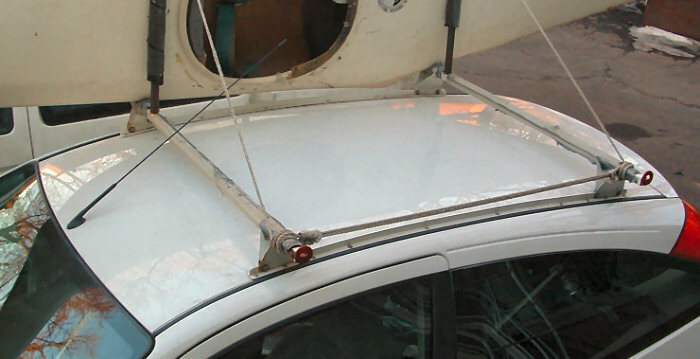 The car has been driven 80 mph (pure accident) with 3 canoes and the C1 mounted, all at once (using bow and stern lines). With a single C1 and/or a single OC1, I don't use bow or stern lines. The "bad part" is that the rack is now a more-or-less permanent part of the car, but I plan on driving it until it's quite used up. I made adjustable steel cross-bars and the extensions to the roof extrusion were triangulated for latteral stability. The uprights are tubes that slide over pins welded to the cross-bars.